With a full day at work it is often hard for people to find time to work out. Some people are able to work out before work, as the Google cyclists do on a regular basis. The group of Googlers, known as, "SF2G," bikes 42 miles to work. Click here to read more about the Google cyclists. Brian from SellYourMac.com takes a different approach. I asked the question, "Why not workout while I work?" 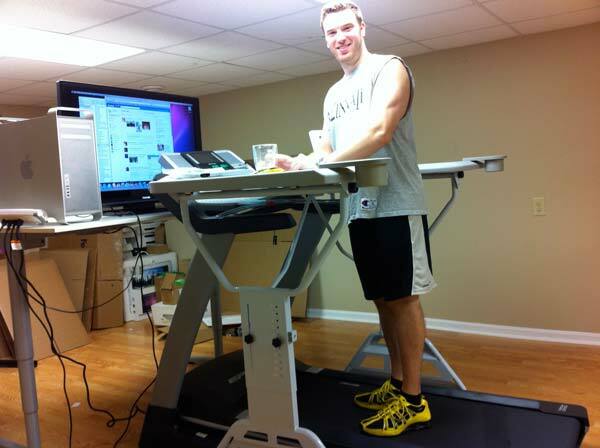 I found the answer to this question by purchasing a treadmill desk called the "Trek Desk" as seen here. Written on 03 December 2010 . Why buy any other phone? The iPhone is rated highest amongst consumers for good reason. It is easiest to use, increases productivity, and provides endless hours of entertainment. Written on 29 November 2010 . Cyber Monday 50% off to FREE on all our iPhone Apps! Check out all our apps by clicking here.